Have you ever had one of those disaster weeks when whatever you cook just doesn't taste good? Well, I am having one of those weeks. 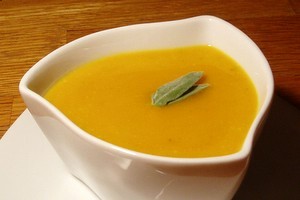 Yesterday, it was the butternut squash soup -- I added too much ginger and it came out kind of abrasive. Today it was trout -- I decided to give frozen fish from Trader Joe's one more try. What a mistake! Isn't it funny, how cooking disasters can look so appetizing, and successes can look so ordinary. I think I am starting to understand why some people don't like fish. They probably grew up on frozen fish that turns into soft rubber after cooking. You might be tempted to tell me that all sushi is previously frozen, or that frozen fish is preserved at the peek of its freshness. Trust me, I've heard all the arguments -- I still don't like it. But in this bleak week of wacky soup and rubber fish, there was one marvelous discovery -- braised fennel. I used to be anti-anything-remotely-resembling-licorice. I hated star anise with a vengeance, and I tolerated fennel only in small amounts. 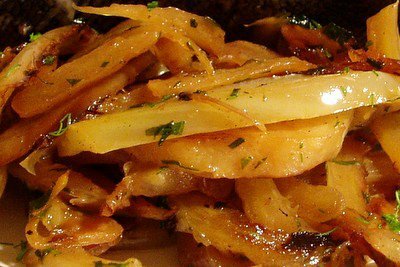 But after discovering fennel’s caramelization powers, I turned into its biggest fan. I’ve grilled it and broiled it in the past with great results. 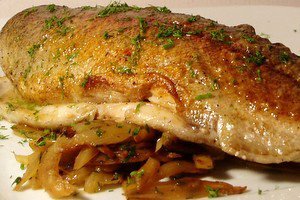 And today, I tried a new preparation inspired by a trout with fennel dish at Ten Tables – one of my favorite restaurants in Boston. It was sweet and minerally, the way a good Riesling is. There was no need for embellishments – no spices, no butter, no cream. Just fennel and a little parsley. Set a large skillet over high heat. Add 1 Tbsp olive oil and wait for it to get hot. Add the fennel and cook until most of the slices are golden brown, stirring not more often than once a minute, and adding more oil as it gets absorbed(you'll probably need about 2 Tbsp of oil total). This will take 4-5 minutes. Don't be tempted to stir fennel too often -- really let it brown. Those caramelized pieces are the best part. Turn down the heat to low, season generously with salt, and add the wine. Cover immediately and steam until all the wine is absorbed and fennel is tender, 7-10 minutes. Taste and correct seasoning. Stir in the parsley and serve. I think that's exactly the reason I didn't like fish for so long--my mom always bought the frozen stuff. Your blog has inspired me to try cooking fresh fish more often--thanks! I only recently learned that I love cooked fennel! Love it! I'm glad your braised fennel came out well. I love the simplicity of the recipe and I plan on trying it soon. My good husband also hates anything that might possibly remind him of licorice, but I love fennel and haven't been able to cook it. I'll definitely try your recipe!